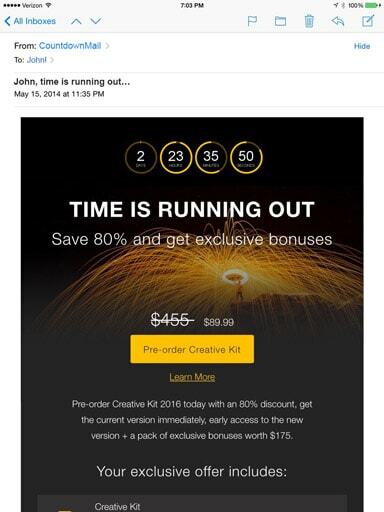 your marketing emails with customized countdown timers. Design countdown timers that perfectly match your email style. Your timer will look amazing in every inbox, on every device. Guaranteed. Countdown timers create a sense of urgency. Creating urgency is a proven technique for increasing sales and conversions. By including a custom, eye-catching countdown timer in your message, you are creating a strong visual call to action based on that sense of urgency. Dates, times, and time zones can lead to confusion and even worse, math! Countdown timers are clear to understand at a glance. Our Countdown timers work with all Email Service Providers! Why should you use CountdownMail? 100,000 sends every month for free. No credit card required. Intuitive timer builder & easy to paste embed codes. Create your timer in any language. Deliver your timer in less than a second with our global content delivery system. Track your campaign with real time impression analytics. Track each time your message is opened. Stay up-to date with the latest updates. Subscribe Now!